Sorry for the vulgar headline, but it encapsulates a nice coincidence in the trap last night. In spite of rain later on, a warm evening brought a rich variety of moths including this interesting pair of pairs. They're a bit like the odd socks which I sometimes wear absent-mindedly. You might not even think that the two Scalloped Hazels at the bottom are the same species, but they are. The one on the left is the 'standard' version; the one on the right the darker, melanistic type, although unlike the Peppered moth which I featured the other day, this is not classified as a separate form or variety. As for the Elephant Hawks at the top, isn't the difference interesting? The one on the left must have hatched more recently, unless it has led a very privileged and quiet life. 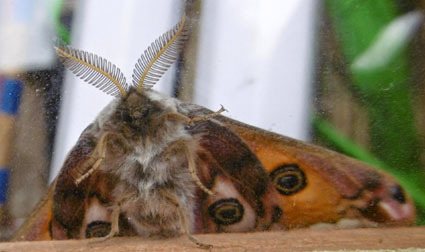 Moths get a tremendous battering from wind, weather and would-be predators during the couple of months which on average constitute their adult lives. The name Emmelina has gone out of fashion for girls. Not so for moths. This strangely T-shaped character is a regular arrival at the moment. It was called Emmelina monodactyla by the great Linnaeus himself in 1758 and no one has seen any reason to change that. Boys as well as girls have been Emmelina for over 250 years. 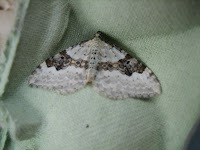 Just as a tailpiece, here's another arrival: the very distinctive blotched version of the Common Marbled Carpet. I am useless at identifying Carpet moths and therefore love this one dearly, because you can't mistake it. It is dozing, very carpet-like, on the finely grained 'floor' of our outside table. Btw a large magpie is coming to our bedroom window bird nuts which is most diverting. Have any readers had hopelessly big birds attempting the same? I am blessed with a very large number of cousins, an excellent situation because they are of all ages and so you meet people at every stage of life quite naturally and without any need for introductions and other niceties. I get the impression that this also applies to moths. I may be being anthropomorphic in Beatrix Potter style, but this pair which were in the trap together strike me as examples of first cousins who get on well and hang out: the Flame (above) and the Shoulder Flame (below left). I am not a classification expert but they come within three pages of one another in Waring and Townsend, have similar habits and of course similar names. They are both masters of camouflage, resembling broken bits of twig or fag ends, and have a similar unusual resting position, clenching their wings tightly to their bodies. The Shoulder Flame has a special place in my affections because it prompts the one light-hearted diversion and the solitary exclamation mark in the whole of W&T's 432 pages. This is when they observe: "Comes to light when it flies wildly, and has the unfortunate habit of occasionally entering the ears of moth recorders near the light!" You have been warned, although I never hang around my light.  It's far too bright, and I prefer to go to bed and return in the morning when the moths in turn are all asleep. Here's the Flame head on, finally. 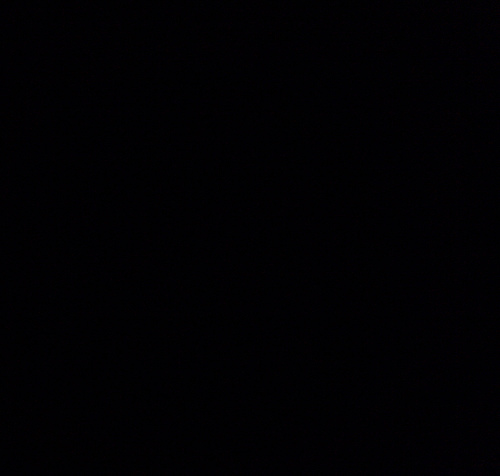 This is what your ear would see, if ears could see and if a Flame decided to follow its cousin's wild adventures. It's nice to celebrate this 400th post on MM with an old and attractive friend: the illustrious Peppered Moth which has played a major part in Darwinian theory. Google it, and you enter a world of competing ideologues, one lot as determined to use the moth to discredit the principle of natural selection as the others are certain that it provides proof of it. I know where I stand; alongside Darwin. But I'm happy just to enjoy the beauty of the moth - look at the lovely salt-and-pepper marking and those antennae, right - and take pleasure in the ever-growing ascendancy of the standard form shown here. When I was a boy, the much duller melanistic version held sway in smoky Yorkshire. The whole Darwinian business involves the shifts between the two forms as their environment changed and camouflage became ineffective. A standard Peppered moth is hard to spot on a clean-barked birch tree or unpolluted walls. The melanistic version hides equally well on grubby foliage or soot-blackened stone. They're not so good for the standard, as shown - I can see you! - below. The surgeon Sir Cyril Clarke did an appealing piece of research which correlated the decline of the melanistic Peppered in the UK with the increase in the number of centenarians (helped by an obliging Buckingham Palace and its records of Royal telegrams on 100th birthdays). I have had both forms here since I started light-trapping in 2004 but have not seen a melanistic one for some years. Thanks to Butterfly Conservation for this piclet of one, left. Quite often, I find moths in the trap which look dead - lying on their backs or sides like the White Ermine a couple of posts below. But like Jairus' daughter, they are not dead but sleeping. This nice little Cinnabar, above, is dead, I'm afraid. I found it in the greenhouse on a window sill, either doomed by the heat and failure to find the door, or caught by a spider. A strand of web entangled its legs. This is a common moth but interesting. It flies by day and has simple antennae, two of the features which distinguish butterflies from moths. My moth Bible describes its colouring as red and black, but I detect a greenish tinge to the 'black'. It has similar cousins in the Burnet moths which have the same colourways (cinnabar is the reddish ore from which mercury is made) and butterfly habits. So is it a butterfly? No. The antennae are not clubbed at the end, which is always the case in butterflies, and the Cinnabar is equally happy flying at night which no British butterflies do (unless you disturb a hibernating Peacock or Small Tortoiseshell from your curtains). No doubt there are other more scientific and taxonomic reasons which I will master one day. Cinnabar caterpillars are a major reason for supporting ragwort against its enemies among the tidy-minded and over-anxious horse owners. Boldly striped in black and yellow they are easy to find on the bright and sturdy weed between July and early September. They feed quite openly and unconcerned because their bold colouring cries out to birds: Careful! I am poisonous. Some humans may wonder if they are also radioactive. One final moth in this day-flying group is the pleasantly-named Burnet Companion, which looks completely different but enjoys daytime outings, often in company with Burnets or Cinnabars. Thanks for the catty pic to www.wyeweb.org. Oh, and here's an update: check our Comments and also this excellent blog: Ragwort-hysteria.blogspot.com. We should all defend the noble weed. The third of the four big hawk moths which come to the garden here arrived last night, though judging by its tatteredemalion state, it has been around for a while. This is the Poplar Hawk which holds its wings in the curious way shown above and below, the fore ones angled back so that the hind ones form part of the leading edge. It could be Barbara Hepworth working one one of her 'hole' sculptures in a old dressing gown, couldn't it? On which score, do visit the fab new Hepworth Gallery in Wakefield some time. It isn't as universally grey as it looks. When disturbed, as happened when I hid it away from a predatory magpie, it shows the reddish patch on its hindwings. This helped it to blend with the Actinidia on which I perched it (pic below) - a climber which has a wonderful range of colours itself. 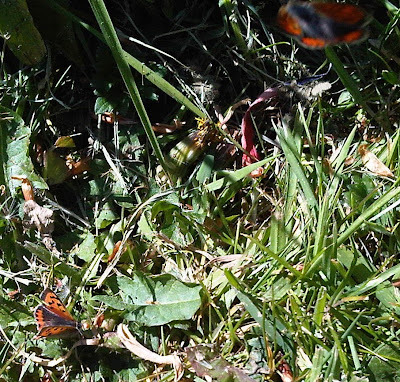 The antennae are that nice foxy russet too (small pic; sorry blurred. The colour gets lost in sunlight as in the pic below). 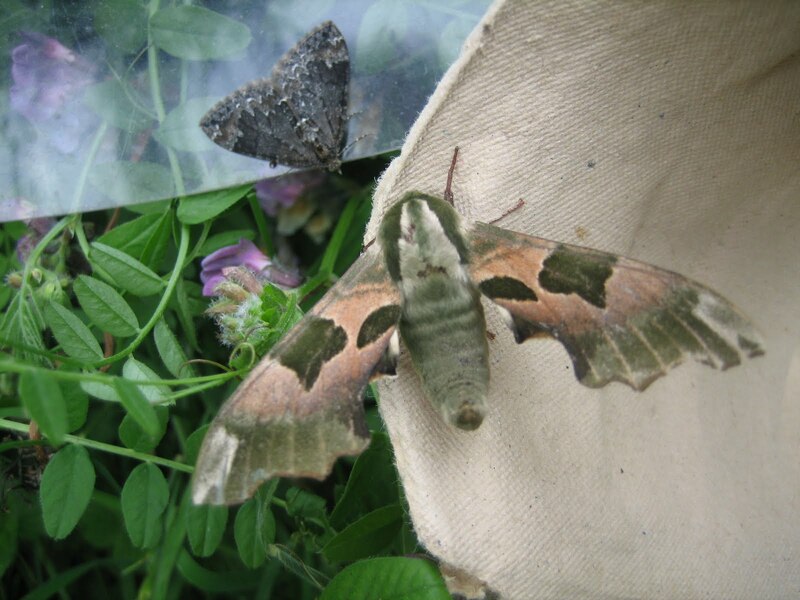 The last of the hawk quartet, the Eyed Hawk Moth, is the most infrequent visitor. Fingers crossed that it pays us a call this year. I went down to Chelsea Flower Show yesterday, on business, and enjoyed the lovely mixture of people out in the May sunshine amid a million garden gadgets. There were a few flowers as well, but they never seem to be the centre of attention, any more than they are at Harrogate. In that regard, I have to say that I prefer little local shows such as Adel, where I once came second in the children's miniature garden class. More recently, I actually won the novices' flower arranging class at Horsforth flower show, beating some nuns which I felt rather bad about. Anyway, this by way of apology for not having trapped the last couple of nights, what with the winds raging recently as well. So I've delved back to the weekend when I was visited by what Google suggests is a Juniper Shield Bug, above. Aren't shield bugs great? They remind me of my Swoppet mediaeval soldiers long ago. 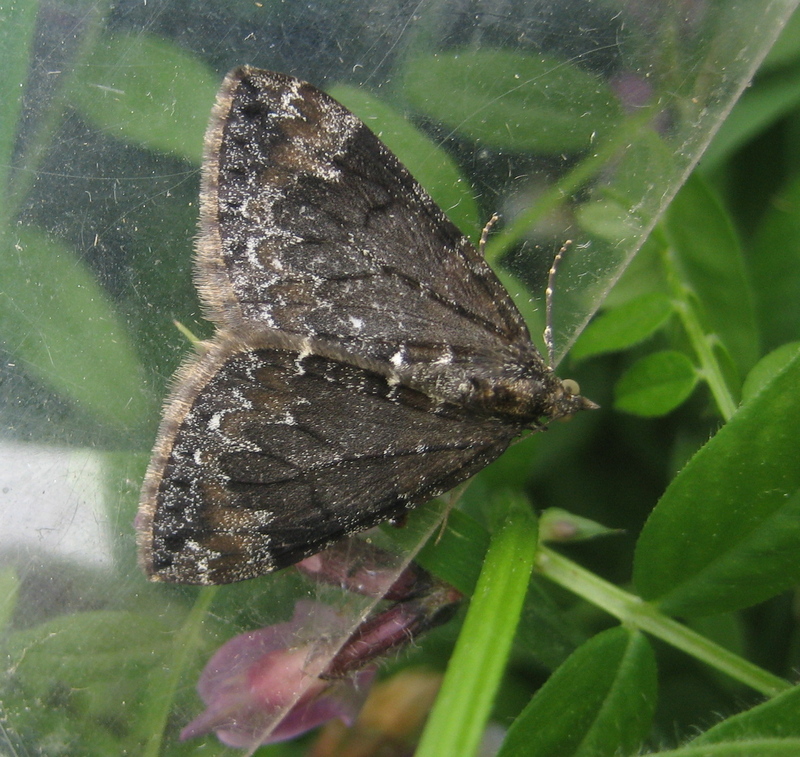 Also in the trap on Saturday and Sunday were this Scalloped Hazel, nigra form, with a liking for bubblewrap (above right) and what I think is a Broken-barred Carpet, left (thanks to Ben for identifying yesterday's mystery moths; I am trying to improve). The slumbering White Ermine below - not as dead as it may look - also obliged me with a close-up pose of its lovely colouring. Often, you don't see the yellowy-orange patterning when the moth is at rest. High winds require strong flyers, and here's one which arrived on cue. The other week, I recorded my first-ever brunnea form of the Lime Hawk moth; now here is one of the normal type, much more greeny than brown. From their size, I think that both are males, so there will certainly be females out there too. But they seem to have decided to stay at home which is the prudent thing to do in current conditions. Penny and I walked up to the shops yesterday evening and small branches were hurtling down all over the place. Earlier, I spent an enjoyable hour motionless on the M62 with Guardian colleagues, right by the famous Stott Hall farm which lies between the carriageways where they cross Moss Mire moor. Contrary to legend (alas) this was not the result of some doughty Yorkshireman or woman holding out against HMG. The alignment of the motorway follows the only places in the treacherous bog where the roads could be safely 'floated' on the peat. At least one of those huge excavators sank for ever in the surrounding morass. Other visitors here, which I will identify at leisure unless (yes please..) Ben or another of my much-appreciated pals does it for me. Two Carpets of some sort and one of the Wainscots, I think. ("Do you know the Wainscots? 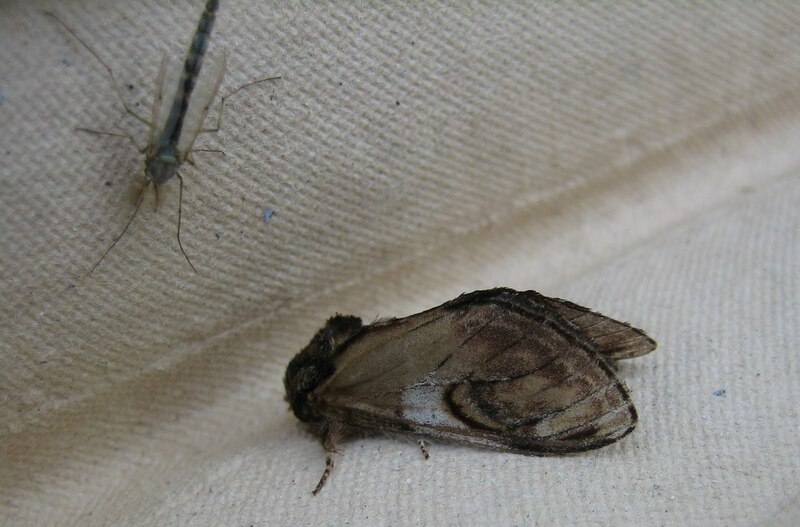 Charming people...") Up above on the right, though, one I do know: a Lesser Swallow Prominent which took the old saying about 'moths to the lamp' literally. I've been at a family gathering in Stow-on-the-Wold where a moth trap wasn't practicable but eagle-eyed nieces, cousins, aunties and other relatives more than made up for that. Butterflies were surprisingly scarce on a ten-mile walk we ambled along, through the Swells, Lower Slaughter and over Wyck Hill, but we found this recently-vacated chrysalis (that really was eagle-eyed; they're not easy to spot) and the Drinker moth caterpillar above. I love these, with their Turkish carpet colouring of rich patterns on a velvety blue background. They were also one of the first big catties I found regularly as a boy. That was because of their habit of creeping up large blades of grass to sip the dewdrops at the top, which made them easy to discover - and gives them their name. They tended to pupate soon after capture and then hatch into big yellowy-brown moths which swooped happily away into the Herefordshire countryside. It's my birthday, hooray, and I always hope that a nice moth will come to mark the occasion. One has, this beautiful Elephant Hawk, a species which has a special place in my life. When I was 12, the marvellous natural history curator at Leeds Museum, John Armitage, encouraged me and my brother to look for Elephant Hawk caterpillars along the verges of Leeds ring road between Moortown and Adel one August. It might have been a risky tip, knowing how disappointed children can be, but John knew his stuff and sure enough, we found half-a-dozen of the curious creatures, which resemble elephants' trunks with small eyes at one end. Hence the name for a moth which is elephantine in no other discernible way. They hatched and we saw this beautiful moth at its newly-emerged best. This one which came last night can't have left its pupa that long ago either. Lovely. Hawk moths have stylishly raked wings, shown here (right) in what looks like a crashed stealth bomber or spacefighter from Star Wars' rebel alliance. I have seen Convolvulus Hawk moths flying round streetlamps in Italy; in fact when I was a teenager, villagers lent me a ladder to catch a few near Ancona. The moths are formidable flyers, as powerful and fast as bats. Since I've written recently about Shandy Hall and Laurence Sterne, it seems appropriate to start this post with the illustration, left. It represents the fact that my trap bulb went phut the other day which had the same effect on my life as the events which led to the famous 'black page' did on Tristram Shandy's. But all is joy now. Watkins and Doncaster speedily sent me a replacement, plus a bit more flex which I hope to use to extend my hunting. And this morning I was nicely rewarded. The Pale Tussock has the sense to wear them woolly side out, the comfier way round. Today is my and Penny's 32nd wedding anniversary, so thanks to the Pale Tussock for arriving on that too. Here is a mega-yucky picture but I thought we could pretend that the person behind the devoted duo was a moth. Just as Bill Ely solves my wasp riddle - see two posts below - look what's flown in. A hornet. Poor thing, it's really quite impressive and finely-coloured, but who doesn't have an atavistic fear of this kind of insect? I never remember seeing one in my childhood, although we spoke fearfully of them after reading about them in natural history books by the likes of Enid Blyton. Mind you, we did sing more tolerantly about them in chapel. With a fortress and an home. Makes them in the porch of God. Good stuff there, from Christopher Smart. Hornets seem much more solitary than wasps in my experience, but they do indeed build nests and hive honey. Hornet honey? Would that sell? Actually, I just did a quick Google and there deos seem to be a product called Giant Japanese Hornet Honey, complete with vast pickled insect. But it cost £24 a jar and was out of stock. As you can see above and below, Penny and I caught this one in a glass for the purposes of safe photography. I read later that a hornet in distress can summon its mates by emitting a 'distress pheromone' but fortunately this system doesn't seem to penetrate glass. En route this time, we saw lots of Green-veined Whites like the one above. Close examination of them intrigues me about the subtlety of butterfly scales. From one angle or in one light, the delicate veins appear the colour of greenish mould, as above; from another, eg below, they are incontrovertably grey. 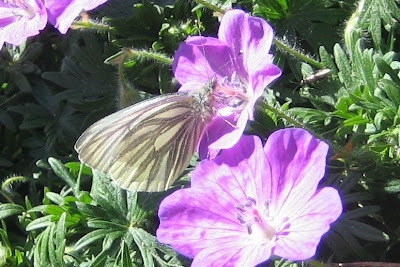 There is also a Black-veined White, or was. It became extinct in its last stronghold of Kent early last century and even an expensive and melodramatic plan by Sir Winston Churchill to reintroduce it at Chartwell was not a success. 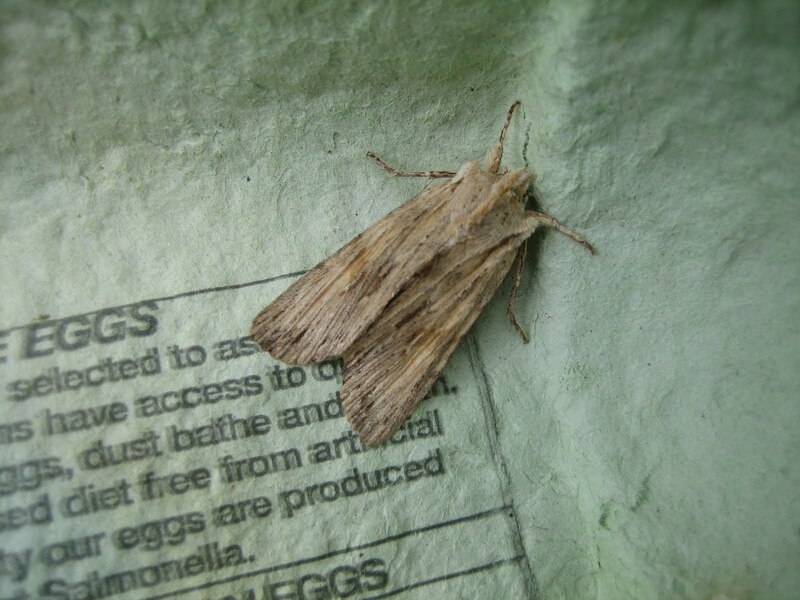 I was going to have another grumble about the chores of identifying moths this morning, using a trio of Spectacle moths. This is an easy one to distinguish because of the strange little pair of glasses which appear to be perched on its nose beneath a quiff - though actually they are patternings on its equivalent of our forehead and placed well above its eyes. Spectacles are coming to the trap in numbers at the moment (in between thunderstorms) and I was looking at these three, below, with more than usual interest. They were the only arrivals the other night apart from two maybugs, and since all were dozy and willing to be gently manoeuvred with matchsticks, I gave them a closer look than usual. They were so different, and I thought that this lent weight to my regular moans about patterns being so similar in different species and also so varied in particular ones. I checked as ever in Waring, Townsend & Lewington, to see if there was much about Spectacle variation - and Lo! i discovered the existence of the Dark Spectacle. This is a different moth, albeit with similar 'glasses', and the very distinctive one of the trio here, in the middle, is one. Silly me. I had always thought the Spectacle so distinctive that I had never previously made this elementary check (and my first Spectacle in the trap, in the little pic at the top) came here in June 2008. So here's another new species for my official tally, though I have no doubt that it has been here before, unrecognised. It's all go in the Leeds insect world. Moths are getting abundant, our garden butterfly count for this year is up to nine and now we've got this, above, in our shed. We had one last year on a sash window and it didn't get a lot bigger, which makes me think that it can't be a fully-fledged wasps' nest. It's definitely something to do with wasps, though. Penny was photographing it when a large one emerged from the hole. You can make it out below the nest in the picture, a bit blurred cos of the lighting level, and also its shadow below the nest's. Quite an artist, is P. So is it an egg-laying base, a sort of incubator? Or does it belong to someone else, with the wasp a nosy predator? Meanwhile, here's what maybe another sort of wasp - the Vespa scooter sort, vespa being the Italian for wasp and Vespas making a menacing buzz. Actually this may well be a Lambretta, but either way it shows that photographic composition is not a Penny exclusive. The little face in the top left hand mirror is my younger son's, on our recent sunny day in Scarborough (see post a few below). I have to admit, though, that this happened quite by chance. Blue. I pine for blue in UK moths. In vain. There is a scrap of it on the Lesser Angle Shades and a couple of pale mauve ribbons on the very rare Clifden Nonpareil which I will be extremely lucky ever to see. I have wondered several times before on this blog about the reason for its absence and promised to investigate when I retire. I am already sure, however, that the answer has something to do with daylight, because we have a great collection of beautifully blue day-flying UK butterflies. Here's one, above, the Holly Blue, and even in a photo as bad as mine, you can see the lovely colouring of its forewings. Unfortunately, like most blues, it is reluctant to show these when at rest and so I have had to make do with the powdery underwing, dotted with dark blueish-black spots. There can be a delicate sheen of brighter blue near the insect's body, caused perhaps by reflective mirror or prism scales, but needless to say I have not managed to capture this. 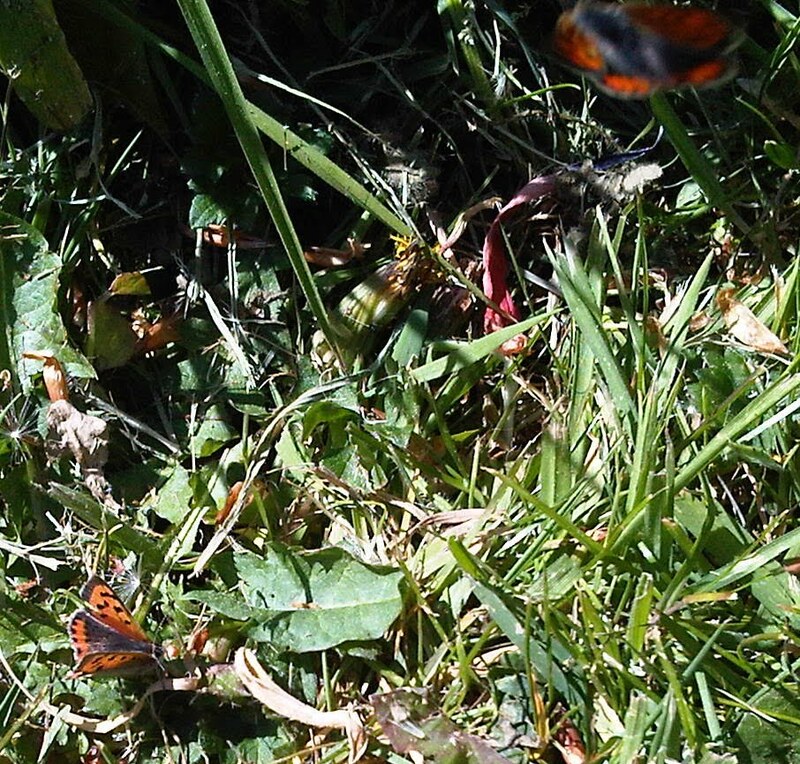 I think my camera was fazed by the brightness thrown off by the underwing in our continuing sunshine. This butterfly is 'mud-puddling' at the edge of our pond. Not a very salubrious spot but good for the insect to draw up minerals through the disagreeable looking 'nectar' of pond sludge. It was absolutely absorbed in the task and lost all the skittishness which is normally typical of small butterflies whizzing between flowers. So I had time to get the picture. I have seen this process on a very large scale in Indonesia, with swordtails and swallowtails in their hundreds on the edge of jungle rivers. When you disturb them, they fly up like a blizzard in reverse. Two 'prominent' moths have arrived, one of them new to my trap and unexpected (above). 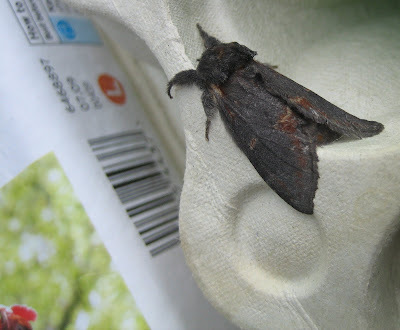 When I first picked out its eggbox and saw something unfamiliar, I thought that it was a worn example of a Swallow or Lesser Swallow Prominent, both common visitors. But no; this is a Pebble Prominent, and according to my moth Bible, it shouldn't really be appearing in northern England until June. Traditionally it has only had one generation in the north whereas the south gets an earlier brood which starts hatching in May. So here is another scrap of the increasingly widespread evidence that southern UK moths are moving north, for reasons which are the subject of much scientific discussion. I wonder what the miniature damselfly-like insect is? I didn't notice it when I took the photograph. Advice most welcome. Just adding to this on 5 May (election and referendum day): I consulted Charlie Fletcher the Yorkshire county moth recorder about the above and he emails in his usual and prompt way to say that my bible, horrors, got quite a lot wrong about flight times in the first edition which has been amended in the second, current one. The errors or out-of-datednesses include limiting the double-brooded Prominents too tightly to the 'south', so this northwards process has been going on for quite a long time. Charlie likes my brown Lime Hawk, I'm flattered to say, and says it's quite rare round here. Yay! The other visitor is an Iron Prominent, a moth which has the same generational difference between south and north, but in its case the two-brood variety has been familiar for quite a long time in the Midlands. Friends of mine in Newcastle-upon-Tyne never cease to tell me that Leeds is in the Midlands, so maybe that accounts for the fact that Irons have been here regularly in the past. But not, I think (and will check) as early as this. The 'prominent' name comes from tufts on the adult moth and humps on the caterpillars of the species, which are also renowned for their fierce ways. All poisonous, their defences include rearing up at both ends and 'spitting' a stream of liquid several centimetres. Just like various children I have known. The glory of the group is the White Prominent, which may alas be extinct in the UK although there are scattered, unconfirmed records over the years. Finally, sorry to plug, but the Guardian has kindly run a piece about moths linked to the BBC Radio 4 programme on Friday which I keep mentioning. Now I'll go away. Sap rising in the butterfly world. I was just down the road at a neighbour's when we spotted a strange whirl of activity - two little objects twisting round and round like a tornado, then separating and heading their own way for a while before returning to the mad dance. 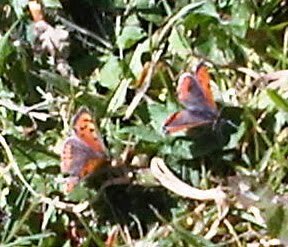 They turned out to be a pair of Small Coppers, full of the joys of Spring. Next year should see plenty more of this lovely little metallic-coloured butterfly, at least down our way. I'm sorry the pictures are poor quality; I only had my 'phone which suffers from my ageing, unsteady hands. But here they are, briefly taking a rest together, and then below, one still on the ground while the other spirals up to see what I am.